Rural Youth Tasmania is full of opportunities, forming the foundation for many young Tasmanians launching into life and adventure. July has covered just that with the exciting announcement of which members are recipients of Rural Youth Study Tours this weekend at the formal event for the year, Rural Youth State Ball. State Ball is a formal event, much like a leaver's dinner, and just as exciting as one! The public normally see Rural Youth members in high vis vests, jeans and boots at Agfest Field Days, but this event means for many; a trip to the hairdresser for styling, dress shopping, and replacing those boots with heels! This year hosted at Bridport Resort, organised by the Northern Region Rural Youth members. Announced at this prestigious evening are those members that have been awarded Study Tours. This year's selection day was held on Saturday July 5th. Members had to submit entry prior to this, along with a letter highlighting their study tour of choice, and why Rural Youth Tasmania should consider investing into the member and awarding them this opportunity. Study Tours available for 2014/15 selection are; Rotary Youth Leadership Camp held in Tasmania, Self-nominated Study Tour to partake in a training course, conference or experience that would benefit the member, the Young Endeavour scholarship (sponsored by Betta), and International study tours to United Kingdom, Sweden, Switzerland and Norway. The United Kingdom Study Tour is sponsored by Davies Brothers Limited. 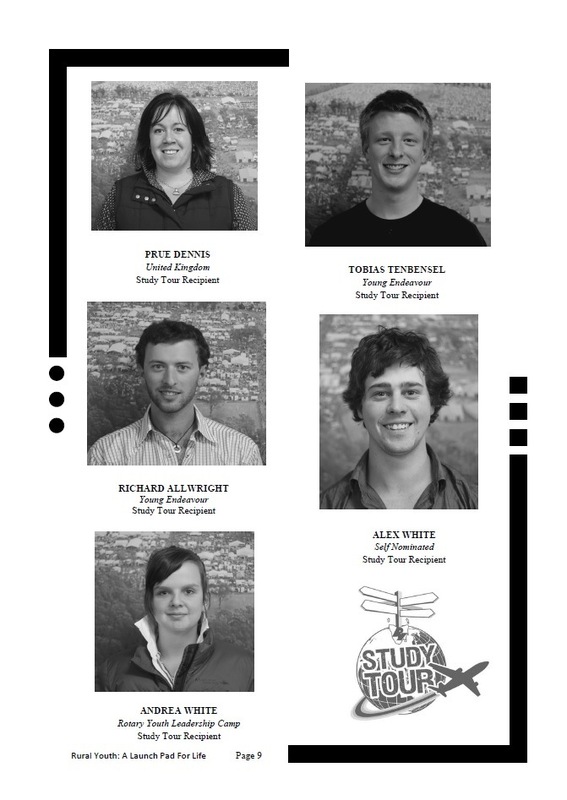 Applicants; Prue Dennis 23yrs of Cressy, Alex White 20yrs of Richmond, Tobias TenBensel 20yrs of Howden, Richard Allwright, 22yrs of Nicholls Rivulet, and Andrea White, 16yrs of Melton Mowbray each went through the process of interviews, 40 question quiz based on knowledge of Rural Youth, Tasmania and general knowledge, demonstration to an audience (public speaking and presentation skills), report writing based on a tour of Boags Brewery. The Demonstrations, always an interesting part of this day for all, saw us watching a 10 minute presentation on knot tying, car racing, bull fighting with a barrel, equine nutrition and how to make a heat source for camping. Thank you to judges Cassandra Hall and Nathan Richardson.